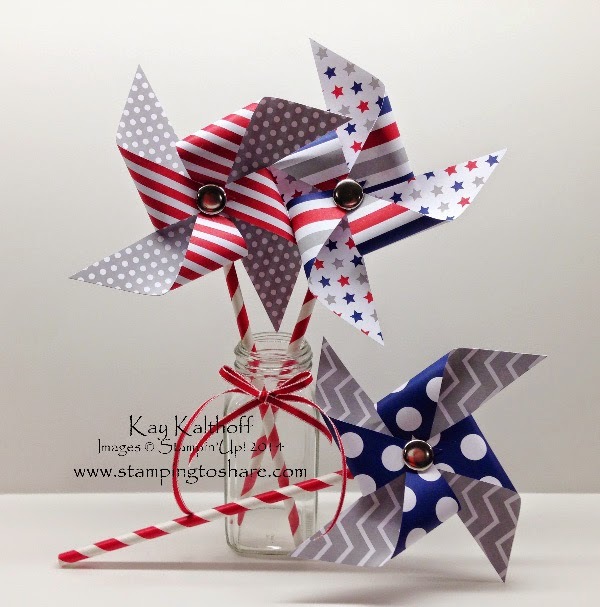 The photo above shows the adorable pinwheels you'll be able to make from the June Paper Pumpkin Kit. Thank you fellow demonstrator Kay Kalthoff for the picture!! My mailman hasn't delivered my kit yet - darn it! You can sign up for Paper Pumpkin HERE and cancel any time you'd like. You can even prepay for subscriptions; it REALLY makes a great gift. When you sign up for Paper Pumpkin, be certain to select me as your Demonstrator to take advantage of my Frequent Shopper Rewards Program! Here's the June Paper Pumpkin video showing what comes in the kit and how to assemble the pinwheels. Thanks for visiting & have a great weekend!